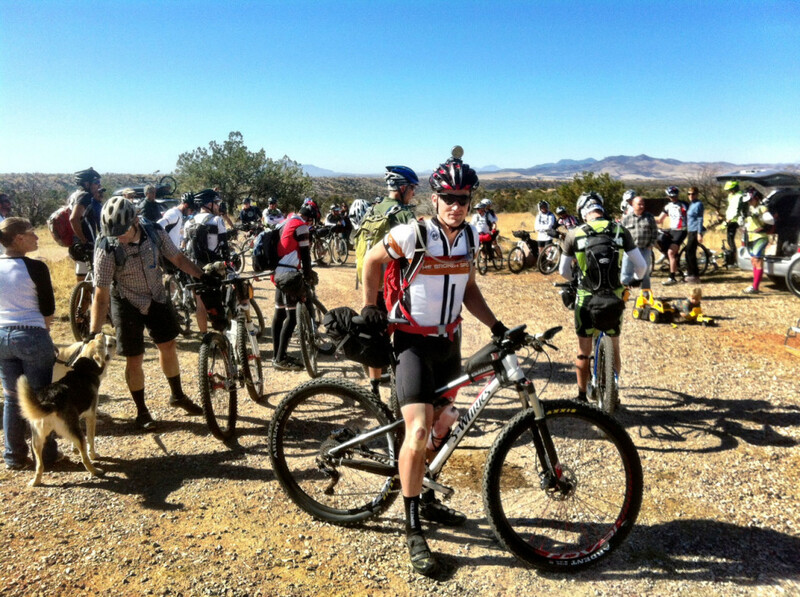 Aaron Gulley at the start of the Arizona Trail Race. HPD: Do you mind sending me a few thoughts on your race? AG: It’s a relief and a point of pride that it all finally came together. I’ve been trying to complete the AZT300 since April 2010, and a combination of inexperience and bad luck prevented me from doing it. The first year I flew directly from an assignment in Korea to the start of an ITT and ended up sick from something I’d eaten overseas — think vomiting and severe diarrhea — and had to bail at Tucson. Year two, my Garmin 705 failed catastrophically at Colossal Cave and I wasn’t prepared to navigate without it. Last year I was having a great run but was turned back in the snowstorm on Lemmon after the police closed the highway. I’ve always known that I had it in me to do this route fast and efficiently. Getting through it this year I finally proved it to myself. I had the faith that I could do it, and finally I made good. HPD: What was the hardest aspect of the trail for you? AG: I’ve ridden Oracle Ridge before, and when you’re fresh it’s fine, if not enjoyable. But this year it was a nightmare. I don’t know if it was the lack of sleep — I started down after 24 straight hours of riding —the extra weight on my bike, the rising heat, or what, but I just flailed. Part of it was the fear of all the sharp rocks and rugged terrain. I just made myself walk a lot of it so I wouldn’t risk crashing or flatting. But by the bottom I was yelling at the trail and in a pretty foul mood. HPD: Did anything happen that was unexpected? Aaron Gulley during the Arizona Trail Race. AG: Though I had a fairly smooth go of it, the section from Oracle to Freeman Water Cache brought the unexpected. I filled water at Kannally Ranch House, in the park east of Oracle. I topped off one bottle from the water fountain, and it was so slow that I decided to fill my 100-ounce bladder from the spigot below, which was attached to a hose. Four or five miles later, well past the Tiger Mine trailhead, I took a draw off my CamelBak and the water tasted horrendous. It had a strong chemical taste and was totally sour in my mouth. I basically couldn’t drink it. It was about 3 p.m., so approaching the heat of the day, and I started getting nervous about being out there without much fluid. I knew I had to drink so I forced myself to take small swigs from the bad water every 10 to 15 minutes. Each time I’d drink, I’d get a gag reflex, and my belly was bloating and painful. Meanwhile, I was really slowing down as well. I started worrying that I was poisoning myself. In the back of my head I knew that was probably histrionic, but I was also sweltering and sleep-deprived, so my mind was playing games. Finally I started vomiting, and I realized I had to stop for a while. I threw up twice and rinsed my mouth from the good bottle of water on my bike. I took a 40-minute nap, and when I woke, though I didn’t feel a ton better, the temps were starting to cool and I knew I had to keep moving. I decided I wouldn’t drink anymore of the bad water. I considered dumping it but decided to save it in case of emergency. I was just crawling along. I mostly couldn’t ride uphill, so I’d walk, and I rationed that last bottle, which lasted till dark. The section around Antelope Peak is notoriously hard to follow, which is why I had planned to hit it in the day, so now that it was dark I was making all sorts of wrong turns, too. Finally, a little after 10 p.m., having not had a sip of water in hours, I rolled into Freeman. I drank nearly a gallon of water straight away, and I was at last able to get some more calories in me. I ate well but very slowly, rinsed all my bottles completely, then got out my bivy sack for the first time in the race and took another 40-minute nap. When I woke, I continued the slow moving, deliberately packing everything up, tanking up on water, just taking my time. I finally rode out at 12:20. Thank goodness the Boulders section is easy, because my legs warmed up again and my body started moving. From there, I had a fast run to the finish. It’s such a good illustration of how many things have to go right and how many variables there are. This was my own mistake: I should have tasted the water before I left Kannally. I did, actually, but only the bottle from the fountain, not from the spigot below. I assume there must have been something in the hose, but who knows. It’s funny how I chose to fill off the hose to save a few minutes but in the end it cost me several hours. Then again, I’m just grateful my body came back around at all. It was touch and go for a little bit there in the heat of the day. HPD: Do you feel satisfied with your effort in the race? I am content that I gave it my best. I had a mostly smooth run, and I worked through the water crisis and never lost site of my goal. I set out with the 48-hour mark in mind, so I was a little disappointed to have been off that. But I rode either exactly to or faster than my projected splits in every section of the race except for that Oracle to Freeman segment, so minus the water issue I did what I set out to do. The truth is it’s never been about a time or a record for me. I always wanted to just have a fast, smooth ride, and in that sense I succeeded. Except for those grim hours after Oracle, I had fun and never felt like I was suffering or miserable. It just felt like an awesome fast tour, and I was so psyched throughout. That’s a mark of success in itself. I’ve also learned that it’s nice to have something still hanging out there. It’s motivation. This run proved to me that 48 hours is definitely a doable time for me if I were to have a perfect race. AG: What struck me was just how fun the entire experience was. People say to me, “Man, you must love suffering to do something like that.” But it wasn’t like that at all. There is so much great trail on this race, and the setting is just sublime almost everywhere, that you simply can’t help but have fun. Even when I was hurting so much on that APC stretch before Freeman, I kept looking up and seeing the big, open sky and thinking how lucky I was to be out there. The last 35 miles, from the Gila to Picket Post, totally blew me away. This was the only section of trail I hadn’t previously ridden, and I was so glad I had not. Riding into a bit of the unknown made it feel like an adventure and also kept my interest. And I never would have imagined it could be this good. I don’t think there is any trail anywhere that is better for mountain biking. The fact that you can ride 48 hours and be totally sleep deprived and exhausted and still be amazed at everything around you … it just speaks to how good that trail is. I won’t say I didn’t want it to end — I was pretty knackered in the last miles. But I was definitely exhilarated by that stretch. HPD: Is there anything you’d do differently if you were to do it again? I’ll be more careful about checking my water before riding out in the future. But seriously, no — I pretty much got my logistics right. I finished with 200 calories and one liter of water. You can’t get it much more accurate than that. 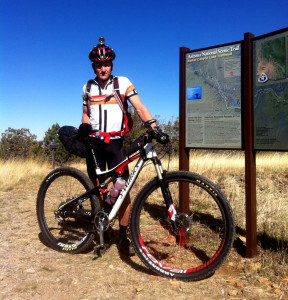 I really enjoyed the solitude of the experience — I didn’t see another person after I passed Max Morris at the store in Sonoita. My wife and some girlfriends were out there camping, but I never ran into them. I like riding alone, especially this time because it felt like something I needed to do by myself. I can’t look back and wonder if I was able to do it because someone else was there pushing me along, or wonder if I could have gone quicker because someone was holding me back. It was all about me, my headspace, my fitness, my plan. On some level, however, I regret that Kurt Refsnider (winner of the 2012 Arizona Trail Race 300) wasn’t in the race. He and I have had some really fun rides together, and I know he would have been there at the front with me and would have pushed me. I still think that his ride last year, when he went over Lemmon in six inches of snow, is probably the most impressive run on this course yet. He was only marginally slower in spite of the stress and strain of that weather — which is damn impressive. He deserved the course record for that effort. He faced down the race and the challenges as they presented themselves. So I kind of wish he had been out there to savor this relatively easier run. I wouldn’t be surprised to see him take another crack at it soon — he has a sub-48-hour ride in him. If not, maybe we’ll get to ride wheel to wheel on the course next year. That would be fun. Great interview. To go from DNF’s to setting a record shows how much heart Gulley has. 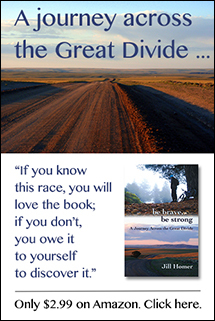 Jill, I really like how your books and interviews get me inside the race and especially the mind of an endurance racer!